Of all the things that need storage when a family goes on the road, it seems that physical media takes up the most space. What do you do with all the files, the photos, the movies and other dvds that accumulate in the house but cannot be physically carried with you? Some folks will rent movies or use netflix, but due to limited bandwidth we have not been able to use any of the online services reliably. We have rented some movies, but like to to have a good selection of movies with us at all times. We also like having increased storage for backup files and such that can be accessed easily. Given these requirements, what is an RV family to do? For us, the best solution was to have a central server that could work through a computer for movies, and could serve files easily. I have not yet implemented all that our setup can do, but this post will detail what I did to have central storage and a good movie selection while on the road. What I chose was a Synology 1512+ server. It has five hard drives and functions as a hybrid RAID, for lack of a better term. One drive is used to keep rebuild data so that the server can lose one of its drives and still function. The user can also “hot swap” drives without shutting down the server, so this made good sense to us. The picture to the left shows a cabinet that is in the middle of our dresser in the front bedroom. This was the best size for us, and would hold everything we needed. To prepare it, I built the shelf and added the plug that is shown on the upper left of the photo. I also drilled two 2 inch holes in the bottom of the walls to aid in ventilation. 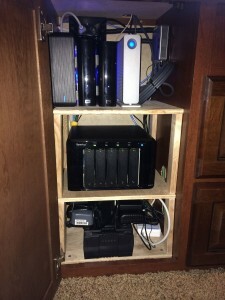 Once the cabinet was prepared, it was filled with synology drive itself (middle shelf), a power supply with a small backup battery (on the bottom), and backup drives on the top shelf. This setup gives me 10 terabytes online with one drive failure protection, and the usb drives on the top shelf give me full backup of the server. In the basement of our fifth wheel is our router which serves as the hub of our home network. The small box in the picture on the top right is a network switch that is hardwired to the router with Cat-6 cable, which means that the server and the printer that sits on top of the dresser are both wired into our network for better bandwidth. 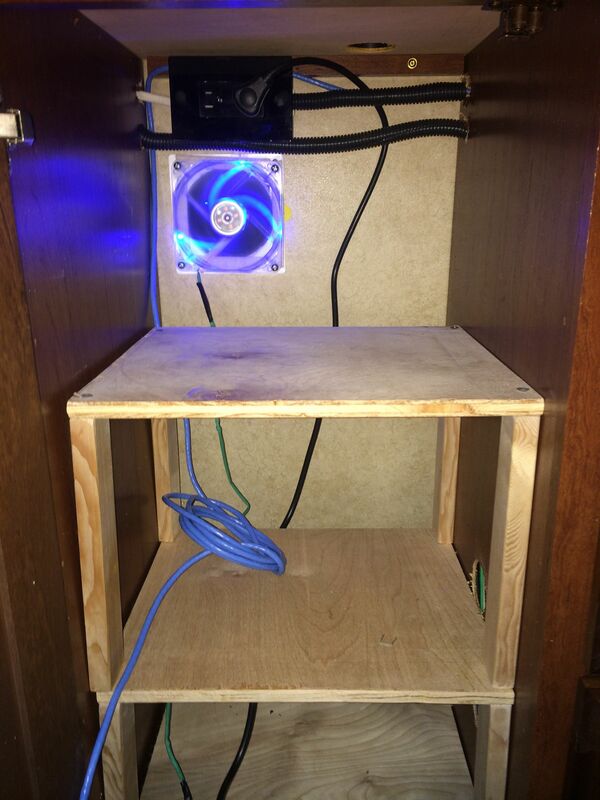 The other part of our movies solution is a mac mini that sits under the TV in the living area of the camper. This machine runs our primary iTunes account, is used for homeschooling, and runs a program called Plex, which is a versatile program for organizing and viewing movies that are in various file formats. If you are looking for a solution to watch movies, I highly recommend Plex. We stopped buying movies on iTunes because you do not “own” them and Apple has way too many restrictions about how you can use the file that you supposedly bought. The mac mini is also wired to the router through Cat-6 cable, for less interference and better bandwidth. To get our movies into the server involves us “ripping” our bought dvds and creating an archive copy of them on the server. The movie file is then extracted for use with plex, and we have a movie quality file that can be viewed anytime by us. Plex functions as a movie server as well, so the movie can not only be viewed on the tv, but can be streamed to our ipads, other laptops, and even our phones. It is quite a versatile setup for us, and the kids really enjoy it (especially since we have no cable or satellite). The biggest issue that we r an into once everything was running was heat. As everyone knows, running electronics generate quite a bit of heat that needs to be eliminated in order for things to last and run efficiently. My solution to this problem was to have the dealer put a dryer vent from the cabinet to the outside of the camper. If you look at the first picture, you will see a blue 4 inch Radioshack fan that runs all the time (currently) to exhaust that hot air to the outside. 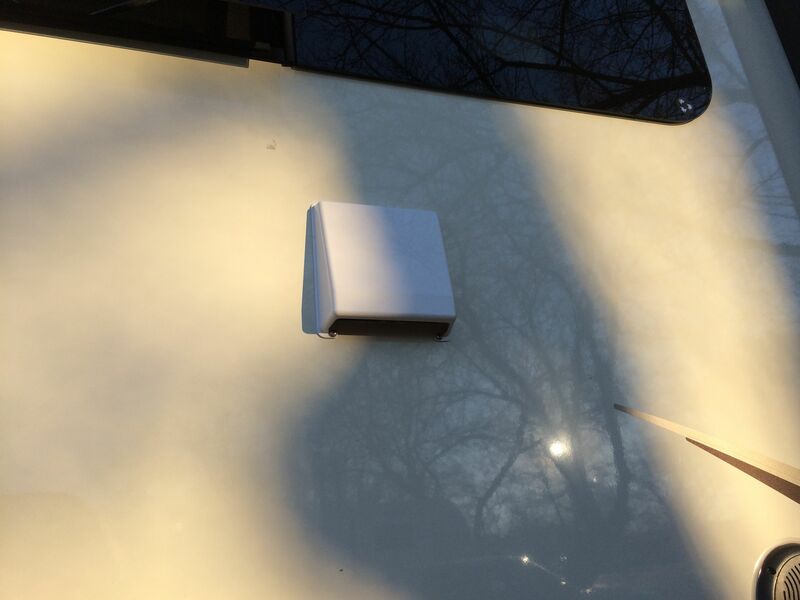 This is working very well, and is very unobtrusive, with the only “evidence” being the cover on the outside of the camper as shown to the left. Now that our setup is up and running, we are very happy with it. It also serves as a way that we can link our various computers if need be since our internet bandwidth is sometimes limited.